A handy Linux Certificate Software for you to create all kinds of professional certificates for education, business, sports, etc with minimal efforts. 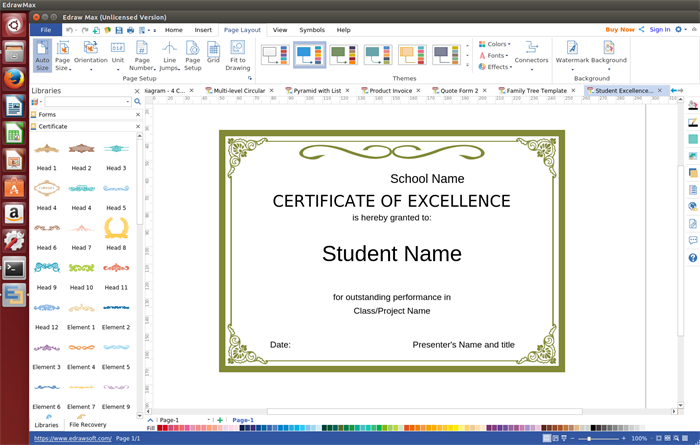 This certificate software gives you ability to design any certificates you need whether you are an educator, or businessman. Thanks to its various certificate elements and templates, creating your desired certificates would be a breeze. Easy to learn and easy to use. Simply draw a certificate by draggsing and dropping the ready-made elements from the library pane and drop them on your page. Rich built-in templates allow you to modify from existing structures, quick and effective. A set of nice-looking themes with advanced effects are available, you can change the theme with just a few clicks. The attached floating dialogues and dynamic help pane give you more detailed instruction to make sure you have a smooth drawing process with no hassle. Various export options including BMP, JPEG, PDF, SVG, HTML, Word, PowerPoint and much more format. Open this software, you will get free certificate elements like like H1 header, H2 header, H3 header, etc. Those elements are editable. 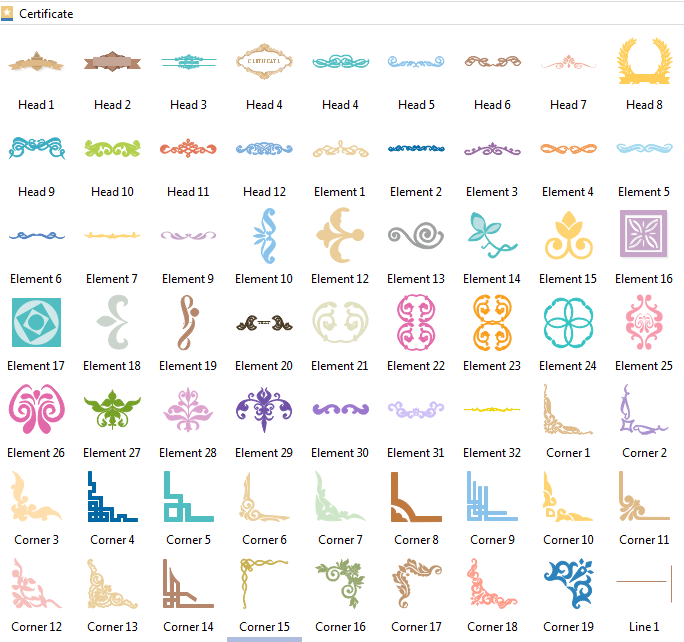 Users are able to edit, customize your own certificate symbols. Simply drag and drop them on the design. Besides, its embedded drawing tools enable you to draw elements on your own. Go to "File" menu > "New" > "Presentation", and then double click "Certificate" icon to open a blank drawing page, or you can also select a ready-to-use example to get started. Drag and drop shapes from the left library to the drawing page, and then edit the text content. After completing a certificate, click "Save" on "File" tab to save the file as the default eddx format, or choose "Save as" on "File tab" to save as other formats such as jpg, png, pdf, etc. 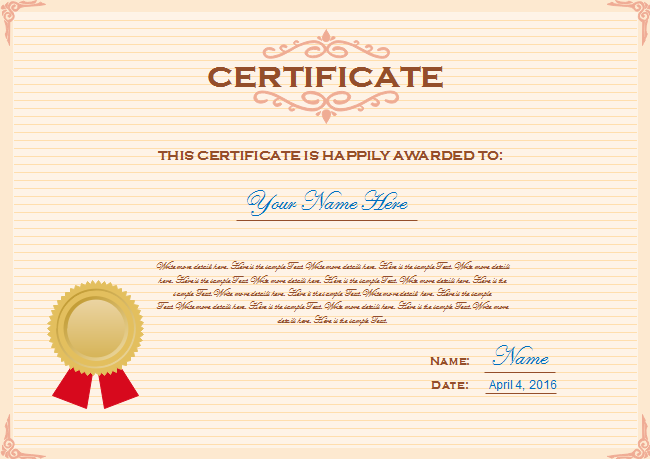 Learn more detailed tutorial on how to create good looking certificate. 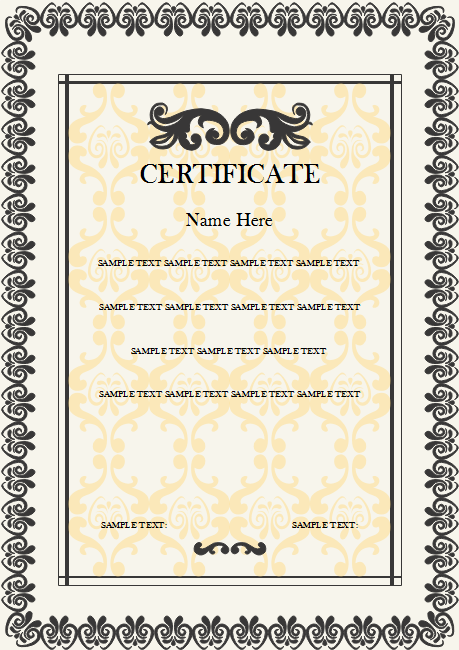 Following are some certificate examples made by our certificate design tool on Linux. Simply save, edit, share and print them. Just free download and try it out.